It was pretty much done when I bought it, but I've got a few plans for it. I've just ordered some clip on bars so I can lower the front end a bit and have fitted a shorter chopper pot style exhaust. Going for a colour change as well, probably metallic green. Just had the forks serviced and they picked up that the stanchions are pitted so I'm thinking of replacing them in the new year. Right then, it's been a while but I've finally gotten around to doing a bit more work on the bike. Had a few issues with the indicators, ignition and carbs that seem to be fixed so it's back to working on how the bike looks and feels. I fitted some clip on bars and I've lowered the front end by an inch or so. She's looking a bit better now, with a straighter and flatter bone line (I've been reading up on the excellent bike exif website: http://www.bikeexif.com/build-cafe-racer ). After the issues I had with the carb, I decided to splash out on a K&N filter which is working like a dream. Also just ordered a new seat: http://www.ebay.co.uk/itm/Universal-Cafe-Racer-FLAT-Seat-SCRFUNI-2-ABS-plastic-/141432326725 I decided to go for a flat seat rather than a hump, mainly because I like the look of them but I've also decided to remove the battery so don't need the space the hump gives me. Finally, I've decided on going for metallic dark green for the tank, it's been stripped down so I'm just waiting for a bit of spare time one weekend to give it a coat of paint. Hopefully I'll get some time over the next few weeks to put it all together and then I'll get a couple of pics up on-line. Just need to work out the best way to secure everything and keep the wiring hidden and protected! Those few changes that you made really spruced her up, looking good! What are your plans for the cockpit? I've bought some alu plate and that I'm planning on making a mount for the ignition. indicator and neutral lights. I've been trying to find a low-profile speedo to try and keep swoop clean but I'm having difficulty. might just have to drop it as low as I can behind the head light and work the ignition etc. around it. 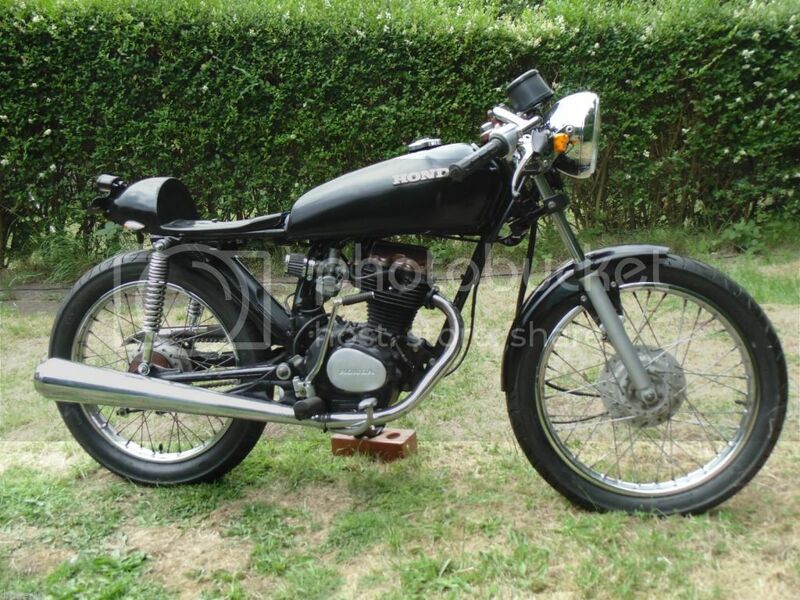 I'm helping a mate build a CG 125 cafe at the moment, so always keen to see what others are doing. You definitely made an improvement dropping the forks through the clamps...we did the same, and also fitted some slightly longer rear shocks to get the back higher than the front, for a racier look. We are also making a high level exhaust, and rearsets. You may find your feet are too far forward with the clip-ons. We dumped that cross member footrest arrangement, along with the main stand, but you also then lose the prop stand too....so today, we made a new prop stand mount to fit to the right side of the frame, as mounted on the left, it would foul the chain run. Nothing is simple, but I guess if it was, everyone would be doing it ! Don't take this personally, but I liked the old look better. I do like the COLOR, though. No problem grandpaul, beauty is in the eye of the beholder! The colour is British Racing Green. I'd be interested to see your footrest arrangement Titan, I don't have access to any substantial machining or welding gear though so I might have to stick with what's there. It would be good to see the high level exhaust as well, I really like them on bigger bikes but I haven't seen one on a 125 yet.